The Wood Colony Tree in front of the Vlach home. West of Modesto, in California's San Joaquin Valley, is an area known for many years as Wood Colony. Wood Colony got its name from Eben Wood, who came to California seeking gold and fortune in the Sierra-Nevada Mountains, but instead found an agricultural gold mine in California's San Joaquin Valley. In 1869, Eben Wood purchased 1,760 acres in Stanislaus County, which he farmed until 1891 — when a severe drought caused massive crop failures. By 1903, irrigation water was brought into the area from the Sierra-Nevada, and people came by the trainload to have a chance at owning a piece of prime, Wood Colony farmland. One of the first of these new settlers was Jacob Cover. Jacob Cover and his wife, Mary, had been farmers in Whittier, California, and in 1904 purchased 60 acres in the heart of Wood Colony. That same year, Jacob built a home on his property, and is credited with planting the very first walnut tree in Stanislaus County; a county which now ranks 4th, nationally in walnut production. That tree, a paradox hybrid, took a deep hold in the fertile Wood Colony soil and to this very day serves as a monument to the productive ground in which it grows. The tree now measures over 100 feet tall and is 28 feet in circumference. This 104-year-old tree is currently the largest tree in Stanislaus County, and is considered to be one of the largest walnut trees in the state of California. 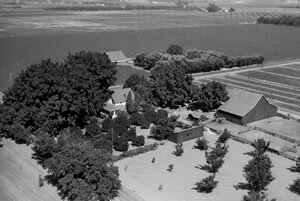 An old aerial view of the farm. In 1932, after living and working on their farm for 28 years, Jacob and Mary Cover sought out Otis and Dorothy Vlach and their son, Emery, a young farming family from the area, and asked them if they would like to purchase the property. The Vlachs, wanting to farm in the Wood Colony area, accepted the Covers' offer. Otis Vlach, and eventually his son, Emery, continued to farm walnuts on the property until 1996, when Emery sold the property to Paul Wenger. The Vlach and Wenger families had farmed as neighbors and close friends for over 80 years. The Vlach home has special meaning for Paul — as his grandparents were married in that very home in 1912 by Jacob Cover, a local minister. Paul Wenger, a third-generation farmer, grew up in the Wood Colony area as a neighbor and close friend of the Vlachs. His family too, has a long history in the Wood Colony area, first settling in Wood Colony in 1910. Paul, his wife Deborah, and their sons, Jeff, Jake (wife Juliana), and Luke are excited to continue the family farming tradition that has been a staple of the Wood Colony area. 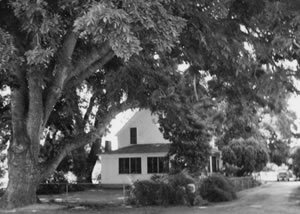 The Wenger's currently farm walnuts on this historic property, and towering over it all as a symbol of the families and history that have made this area so agriculturally significant, is that massive 104-year-old walnut tree — the Wood Colony Tree. 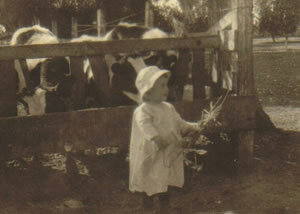 Young Kenneth Wenger with the Holstein Cows. Our family first settled in the old Wood Colony area, west of Modesto, when Graybill Wenger came over from Pennsylvania in 1910. Graybill purchased 40 acres of land in 1911 and started milking cows on his own registered Holstein dairy. Graybill was milking 70 cows by hand — more than most dairies in the area. He also started building a house for himself and his new wife, Ellen, which he completed in 1912. This original house has been a home for 3 different generations of our family and serves as headquarters for both Wenger Ranch Inc. and Wood Colony Nut Co. In 1920, Graybill purchased another parcel of land across the street from his own giving him a total of 88 acres. 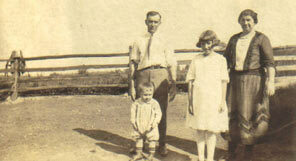 Graybill and Ellen had two children, Kenneth and Katherine. Kenneth grew up milking cows by hand and was eventually able to convince his father to convert more and more land to farming. In 1946, Kenneth married Betty Breshears. In the late 1950s, Kenneth started planting walnut orchards on the ranch, and in 2003, the last of the original 88 acres was planted into walnuts. In 1980, Kenneth turned the farming operation over to his son Paul, a recent graduate of California Polytechnic State University. Paul has expanded the farm to include custom spraying, harvesting and walnut hulling. Paul and Deborah's three sons have grown up working on the farm. Oldest son Jeff, a graduate of California Polytechnic State University, works full time on the family farm and is an integral part of the custom spray business. 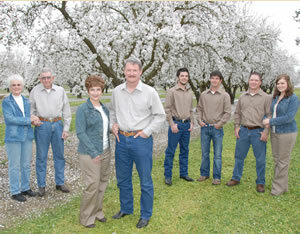 Middle son, Jake, and his wife, Juliana, both graduates of Fresno State University, help manage a walnut and almond ranch in the nearby town of Hickman and help with Wood Colony Nut Company, while the youngest son, Luke, plans to return to the family farm upon graduation from California Polytechnic State University. 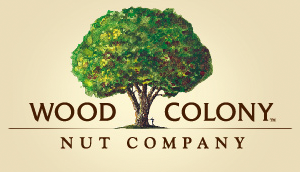 Wood Colony Nut Company is taking the next step toward bringing fresh walnut and almond candies, directly from our trees to your table.